To assist in keeping up the deception, we will form secret societies and clubs… and so by fair means or by foul we shall gain our ends and carry on our dishonest proceedings with impunity. ~ Plato, The Republic. Book II, p.48. ~ D.S. Phelan, Catholic priest. .... The reason the ‘literary society’ of Skull and Bones is of particular concern is that its members are required to take an oath (see later) that completely absolves them from—takes precedence over—allegiance to any nation or king or government or constitution, including the negating of any subsequent oath which they may be required to take, that conflicts with the interests of the Order. To whom then do they swear their ultimate allegiance? We must go back to the origin of the Order to see the roots that sustain these branches. The masterminds behind the formation of Skull and Bones were William Huntington Russell and Alphonso Taft. Russell, while on a student tour of Germany, was initiated by him into the Illuminati. Russell took his newfound wisdom (or ‘illumination’) back to America; and in 1832, a group of Yale undergraduates, led by Alphonso Taft and Russell, formed a society called, “The Skull and Bones,” modelled after the old Phi Beta Kappa Society of 1776 and set up as Chapter 322 of the German Illuminati. Today Skull and Bones’ corporate name is The Russell Trust Association, which finances Skull and Bones, and also supervises the Order’s adherence to the tradition. Let On us look more closely at Skull and Bones and its grotesque initiation ritual. April 23, 2001, ABC News reported on a Hidden Video Capture  of the Skull and Bones initiation ritual. From this video we know that the initiation takes place on the campus of Yale University in a building called “The Tomb.” Ron Rosenbaum, columnist for the New York Observer, hid out on the ledge of a nearby building and videotaped the nocturnal initiation ceremony in the Tomb’s courtyard. 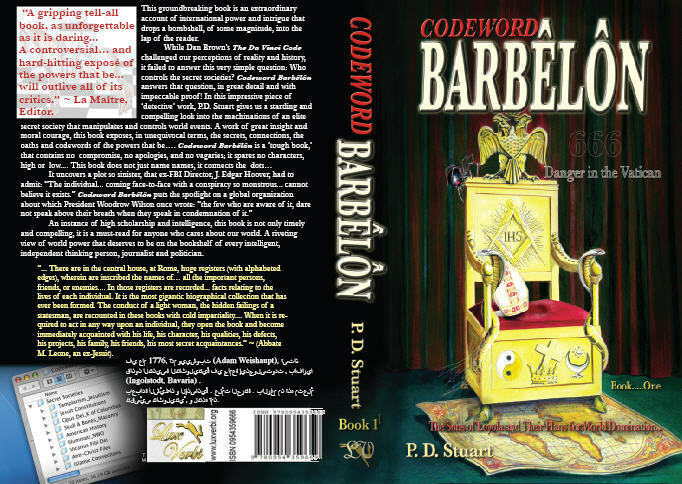 He says that in the room “The death’s-head logo stamps everything from crockery to painted borders on the wall.” There were three people officiating—one dressed like the pope, another like Hiram Abif (the Masonic Messiah) and a third like a Don Quixote [D]. Why the Skull and Bones ritual would have as officiants Bonesmen dressed like the pope, Hiram Abif, and Don Quixote? Let’s look at this a bit closer. 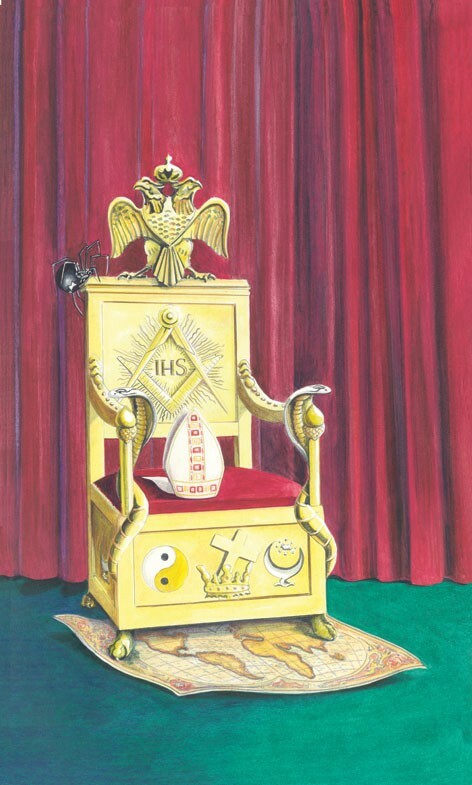 However, we need not strain for an answer: the pope represents the supremacy of Catholicism; in Hiram Abif we have the well-known representative of Freemasonry. But who is this character Don Quixote? The Jesuit Carroll Quigley once said, “Look at the real situations which lie beneath the conceptual and verbal symbols.” So let’s take his advice. Quixote was satirically characterized as the epically famous “madman” of Azpeitia. If we start with Miguel de Cervantes Saavedra, the author of Don Quixote, we discover that not only was he a “strict Roman Catholic” it is believed that he also attended a Jesuit school in 1566: “Cervantes is likely [to have] enrolled in a Jesuit high school (colegio).” Next we find that Cervantes’ book Don Quixote expressly refers to the pope as “His Holiness the Pope…” and “his holiness Pope Pius V of happy memory.” (pp. 138, 331). Another link to the Jesuits is the use of the skull and crossbones emblem. Earlier we saw that when a Jesuit of the lower rank is to be elevated to a position of command, he is conducted into a Chapel of the Order, where he swears an oath under “a banner of yellow and white [the colours of the pope], and... a black banner with a dagger and red cross above a skull and crossbones.” Bonesmen likewise take an oath of inviolate secrecy while standing before a skull and cross-bones. So, here we see that the Skull and Bones initiation, like that of the Jesuits uses the occult icon of the skull and crossbones. It is also curious that the emblem of the skull and crossbones is the symbol of the Chancellor for the Knights of Columbus. Interestingly, at the initiation of Mason the candidate is placed in a coffin and then lifted up; and when he opens his eyes he is confronted with a human skull and crossed bones. 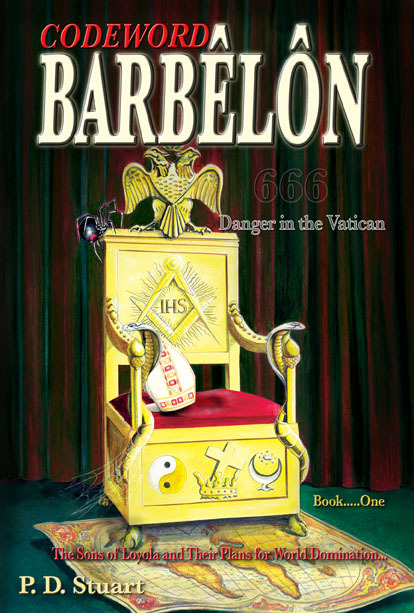 Are these similarities between the initiation of Skull and Bones, the Jesuits and Freemasons just another coincidence? We note too, by the by, that Albert C Stevens (the respected historian) also makes an interesting connection between the Masonic Kappa Sigma society, founded in 1867 at the University of Virginia, and Skull and Bones. On page 355, Stevens states, “The badge [of Kappa Sigma] is an inverted crescent of gold, attached to and below which, by four of its points, is a five-pointed star [the pentagram] with the letters Kappa Sigma in its center…. At the top, on the crescent, a skull and bones are engraved; at the left, the crossed keys [a symbol of the pope’s power], and at the right, crossed swords.” Is this all mere coincidence? .... the initiate is whipped in the face with the tail of the Bonesman dressed as Don Quixote (the classic literary character symbolic of Ignatius Loyola). He is next taken quickly before the Bonesman dressed like the Pope. The initiate must bend and “kiss the Pope’s slippered toe.” This very fact—kissing the slippered toe of the pope—shows that their first allegiance is to the pope! Just as the ‘faithful’ Catholic kisses the toe of the bronze statue of St. Peter, inside the Basilica at Rome, so too, the Bonesman must kiss the pope’s slippered toe at his ritual initiation into the Order. .... Is Bush a Christian? Judge for yourself. At one stage in the ritual initiation of Skull and Bones the initiates must “lay naked in coffins and tell their deepest and darkest sexual secrets as part of their initiation.” (Esquire, September, 1976, p. 85). Satanic high priest Anton LaVey explains the significance of this in his book The Satanic Rituals: Companion to the Satanic Bible: “The ceremony of rebirth takes place in a large coffin... This is similar to the coffin symbolism that...is found in most lodge rituals.” Curiously enough, during the 1988 Presidential Campaign, a TV reporter asked Vice-President George H. W. Bush Sr. (father of President George W. Bush) whether he was a Christian. Bush Sr. initially stammered, but then said, “if you mean born again, then, yes, I am a Christian.” Now, was that a misleading statement on the part of George Bush Sr.? Is he a Christian or just “born again” Bonesman? .... So, how does Mr. Bush see himself? “I’m here for a reason,” Bush told his chief political aide Karl Rove after the September 11 attacks. Close friends of the President speak of his views in similar terms: “I think, in his frame, this is what God has asked him to do,” said one close friend. One senior administration official said, “[Bush] really believes he was placed here to do this as part of a divine plan.” So, what exactly is Bush’s “divine” “mission”? That is the question: is this “divine plan” of God or someone else? We need not guess at the answer. Only two years into his presidency and Bush made the following statement when addressing 60 bishops and other church leaders at a reception he hosted at the White House: “The best way to honour Pope John Paul II… is to take his teaching seriously… and PUT HIS WORDS AND TEACHINGS INTO ACTION HERE IN AMERICA.” Three years later, in 2004, Bush told a Knights of Columbus gathering that he was their “friend in… administration,” and that together they would work “to change America”! Is President Bush a secret Catholic, you ask? Really, dear reader, you are far too inquisitive! Eulogia! Intelligent reader, whenever you hear a man express such views, as freely as Bush does, you can be sure that he is either a Jesuit, a tool of the Jesuits or that he has been “poisoned by their maxims.” Take your pick, the conclusions are not far different. ....! .... The Belfast Telegraph, April 14, 2007 reported: “US President George W Bush will meet with Pope Benedict XVI at the Vatican in June.” This meeting took place on June 9, 2007. Both men exchanged gifts. Why would the President of the United States of America go to Rome to kiss the ring of the king of the Vatican? Bush had a “closed-door discussion” with Pope Benedict! As one of my acquaintances asked, “What did Bush and Benedict say to one another during those 35 minutes of privacy following the journalists’ departure from the Pope’s [private] library?” Equally fascinating is the significance of Benedict’s ‘message-packed’ gift to the U.S. commander-in-chief: a rare first edition of the autobiography of John Carroll of Baltimore. John Carroll was the first Catholic Archbishop of the United States and founder of the first Jesuit university in America—Georgetown University! Well said were the words of President Ulysses S. Grant: “…all secret, oath-bound, political parties are dangerous to any nation, no matter how pure or how patriotic the motives and principles which first bring them together.” For as Arkon writes, members of these secret societies seek to “gain financial and social power, and to place them at the disposal of the group,” Indeed, we have good cause to fear the Jesuits and their acolytes (Bonesmen, Rhodes Scholars, Phi Beta Kappa, etc., etc.) whose sole aim is to place men in high office—as advisers to presidents, congressmen, senators, Whitehouse aides, and Supreme Court Judges—to further their secret oath-bound purposes. Quoted Michael Hirsh, “America’s Mission,” Newsweek: Special Edition, December 2002– February 2003, p. 10. Note: Lux-Verbi does not necessarily hold the views of the author.